The tradition of “camp meetings” – or week-long religious revivals – dates to the late-eighteenth and early-nineteenth centuries when rural worshipers would gather to hear sermons delivered by itinerant preachers. Because most worshipers had to travel long distances and were unable to return home at night, they literally camped at the designated site for the duration of the event. 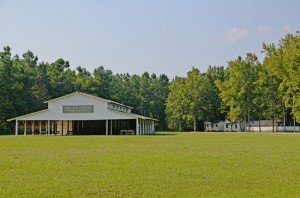 Indian Fields and Cypress Methodist – both in Dorchester County – and Cattle Creek Campground in Orangeburg County are three examples of early campgrounds that continue to host annual revivals today. However, all of these campgrounds serve white congregants. 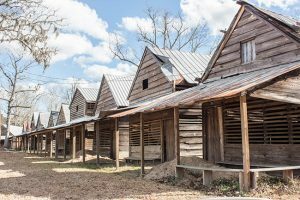 It wasn’t until after the Civil War that black campgrounds in the South could be organized by former slaves. Before Emancipation, they were not allowed to travel freely or worship on their own. Independent black denominations that had been active in the North since the early-nineteenth century – such as the African Episcopal Zion Church – eventually began to spread to the South, and campgrounds where people from these denominations could gather were established. 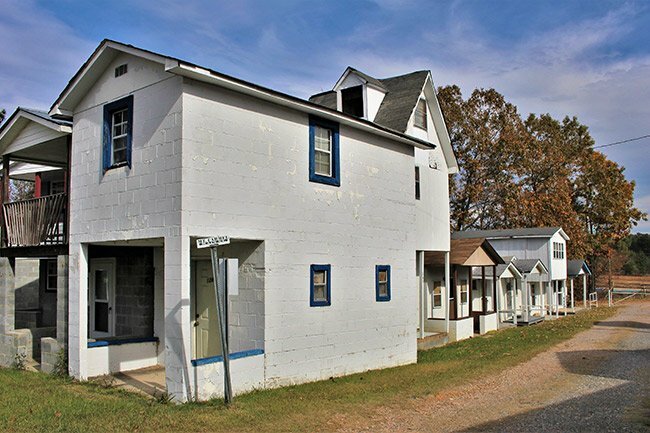 Mount Carmel AME Zion is located in the rural Lancaster County community of Cauthen’s Crossroads, and it is said to be the oldest black religious campground in South Carolina. It was founded around 1868 by the Reverend Isom Caleb Clinton, a former slave who was later ordained as a bishop of the AME Zion church. 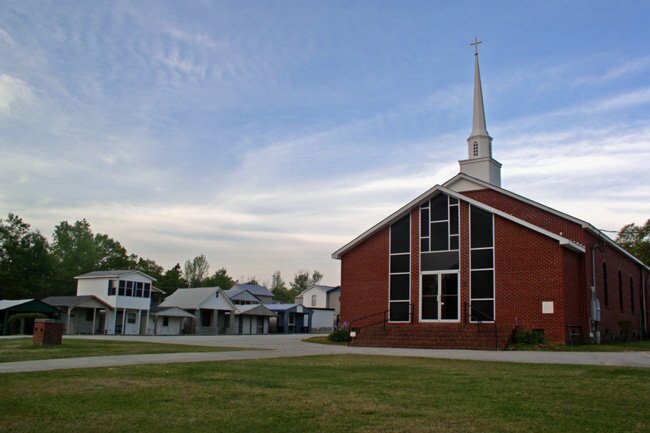 The denomination grew throughout the state under his influence, and Clinton College (formerly Clinton Junior College) in Rock Hill bears his name. 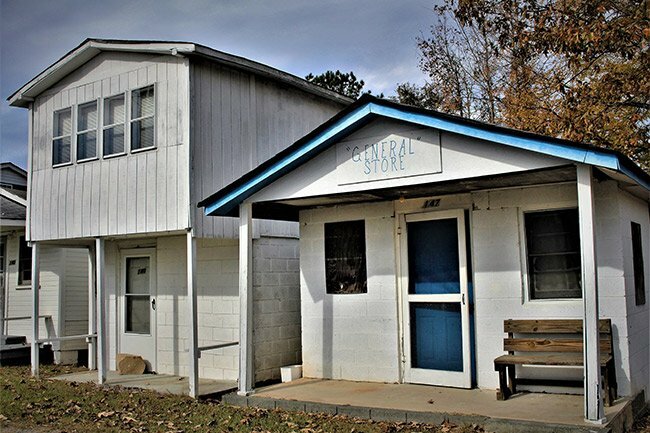 Somewhat unusually, the Mount Carmel AME Zion Campground includes a brick-and-mortar church – the fourth to serve the congregation – as well as 55 “tents” or cabins and an “arbor” or open-air tabernacle. The church is used for regular worship services, but each September, people come from Lancaster County and surrounding communities, and even from out of state, to gather for a weeklong revival. The earliest tents were indeed made of cloth, but as revivals became more regular, most families constructed small cabins for shelter. Traditionally, these are still known as tents. Many of Mount Carmel’s current tents have been modified with metal and concrete to ensure stability. These primitive accommodations afford families a place to sleep but not much more. People cook outdoors during camp meetings, and outhouses are typical features. 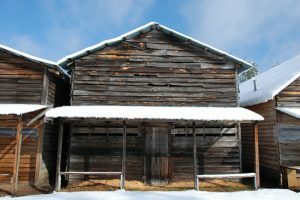 The purpose of such rustic living is to encourage people to gather in fellowship when they are not worshiping in the arbor. The name “arbor” honors the early history of many rural churches; these congregations initially met beneath brush arbors until they could build a sanctuary. As is the case with other campgrounds, the arbor at Mt. Carmel is in the center of the tents, which form a rectangle around it. 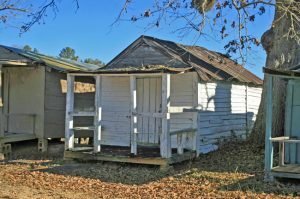 Other active campgrounds in South Carolina founded by black congregations are St. Paul and Shady Grove, both in Dorchester County, and Camp Welfare in Fairfield County. 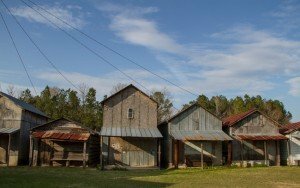 Mount Carmel A.M.E. Zion Church and Campground is one of the earliest sites in South Carolina associated with the establishment of the African Methodist Episcopal Zion Church. Founded ca. 1866, Mt. 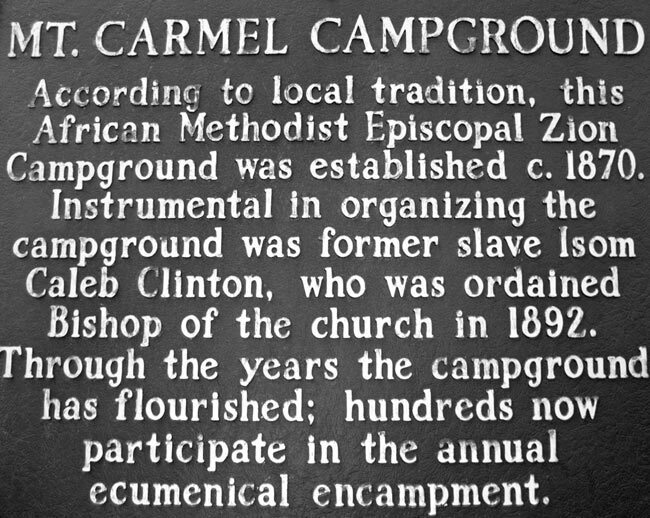 Carmel A.M.E. Zion Church and Campground was part of the widespread growth of independent black churches that occurred in the South during the post-Civil War era. 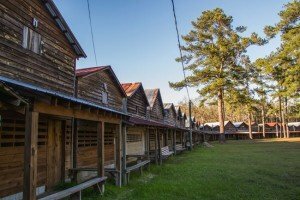 Mount Carmel A.M.E. Zion Campground consists of a complex of structures located in the general form of a rectangle. 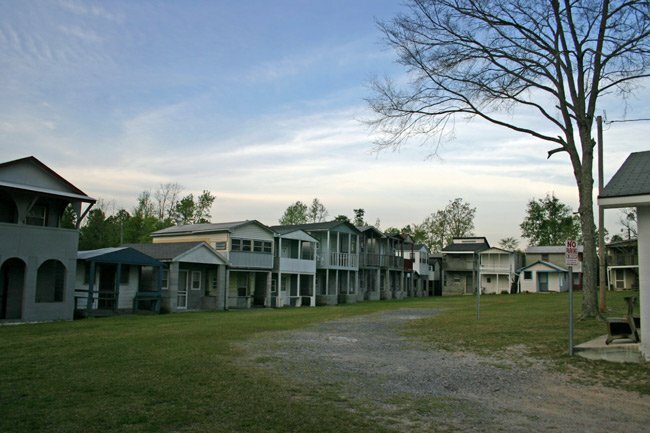 A line of approximately fifty-five small “cabins” or “tents” and a brick church lie along the outer edge of the rectangle, creating a large open area in the center. An “arbor,” or open-air structure, is located in this area. 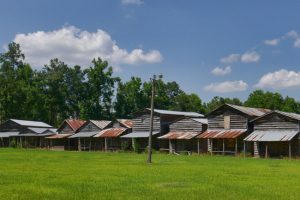 The majority of the cabins are small frame or concrete block structures with metal roofs which are still situated directly along side each other and oriented towards the center of the rectangle. On the southern side of the campground is Mt. Carmel A.M.E. Zion Church, a brick structure with a belfry and gable roof. On the northern side is the church cemetery. Although significance of the site is primarily historical and not architectural, the design of the campground and its landscape reflects its use as a setting for a collective religious experience. 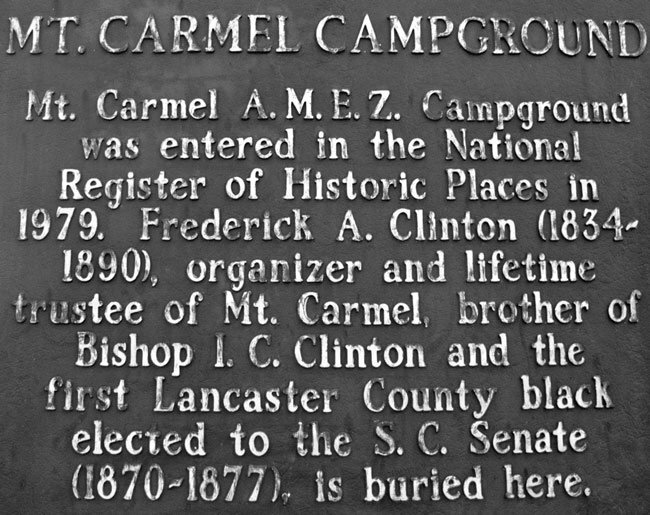 Mount Carmel is also among the state’s few surviving campgrounds where annual gatherings continue to be held. Additionally, the rectangular design landscape exemplifies one of the typical shapes of nineteenth century religious encampments. Good morning, I am emailing in regards to the camp meet. We would like to be a vendor at the event. Our business is From Start To Finish LLC. we specialize in sweet treats and gourmet popcorn. We heard about the event at the Chit Chat that was held at the Transformation Center in Rock Hill,S.C.